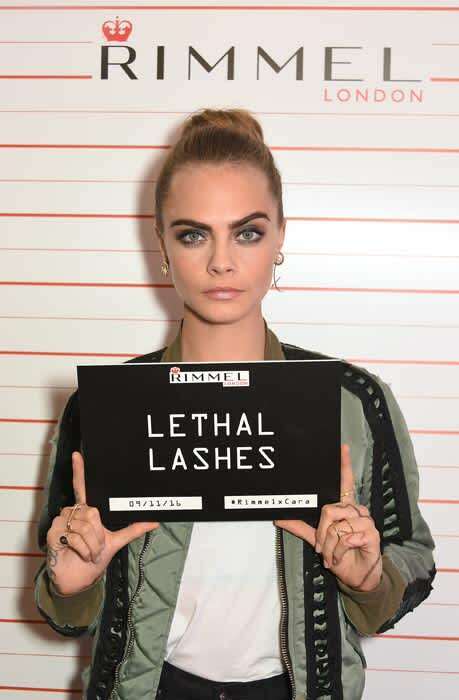 Newly single Cara Delevingne reveals meaning behind new tattoo at Rimmel launch | HELLO! Famed for her full, bushy eyebrows, Cara Delevingne is one of the biggest British beauty icons. So it's fitting that the mega model is the latest member of the Rimmel family – and what better way to celebrate her new role by throwing a party in London on Wednesday night! We met with Cara ahead of the super cool Shoreditch bash, grabbing a pic with the star before she headed out. We also managed to ask her her biggest beauty regret... Unlike us (think major foundation lines, opaque blue eyeshadow and unsightly DIY fake tan streaks) Cara couldn't think of one beauty fail. "I don’t have any beauty regrets because I just don't regret anything at all in life," she told us. "I stand by all of my beauty looks!" The star, who recently split with her girlfriend St Vincent, also dished on the meaning behind her latest tattoo. "At the end of it it says feral because I think I am, and it's about reinvention, shedding of old skin, new beginnings, new life," said Cara, according to the Sun. Cara was dressed to impress at the launch, rocking a bomber from Unravel with skinny black jeans and platform heels. She topped off the look with a gold Carolyn Colby choker, a high bun and her signature smokey eye.